My daughter was recently lamenting that, because of my heavy load at school, we hadn’t cooked together much lately. I agreed. She suggested Rice Crispy Treats as my absolution. The day after my last final, this was our creation. As I’ve previously shared, she likes to add crazy ingredients to things as much as I do. We started with the obvious…M&Ms. Red sprinkles. Even a little white chocolate over one side, because she didn’t think she’d like it. Then we decided to go a little crazy: mint extract. Just 1/8 teaspoon or so (I don’t really measure) was perfect. I’m starting to plan my attack for teacher gifts, and I’m thinking this year’s will include some Rice Crispy Treats. But don’t be alarmed if I go really crazy. I’m thinking white truffle oil, browned butter and pine nuts. 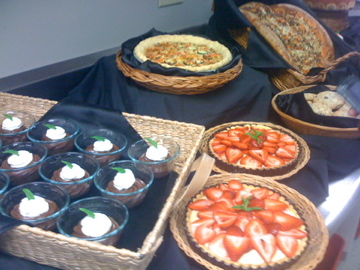 Lovely goodies from our buffet: chocolate mint mousse, strawberry tarts, quiche, focaccia and cookies. I came closer than I had ever imagined possible to either crying or wringing someone’s neck during our Baking I final practical exam today, when our groups produced a buffet of eight baked goods for evaluation by the instructor. Some of the hardier goods, such as cookies, we made last week so today wouldn’t be so jam-packed. I made my semi-famous Sweep the Floor Cookies, replete with dried cherries and the very finest couverture white chocolate (a score from the dry storage room). I lovingly portioned them out on a sheet pan, labeled them with an ominous “DO NOT USE,” and put them in the walk-in freezer. And they were never to be seen again. Although I put a hand on a few things, the only other item I can say I made completely is the mousse. But as a team, we knocked out quite a buffet. I think we’ll get a good grade. 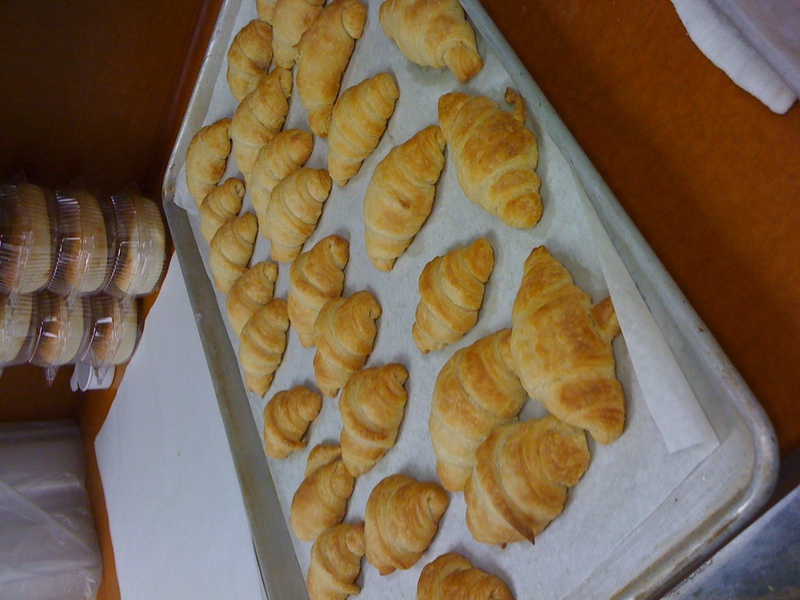 Last week, we had a short class in Baking I and were not going to have the chance to bake off the croissants we made the week before. Since I’ve already established the reputation as one who pitches a fit against food waste, I thought, why not…I asked if my group could go into the kitchen alone to just bake ’em and go. Permission granted, so long as the other chef whose class was still in the kitchen was OK with it. She was, so we did. Aren’t they pretty? I should note that Kathy, one of my teammates and fellow non-trads, rolled this particular tray. She did a beautiful job. Will go over method another time, if you like. Anyone want to try this at home? 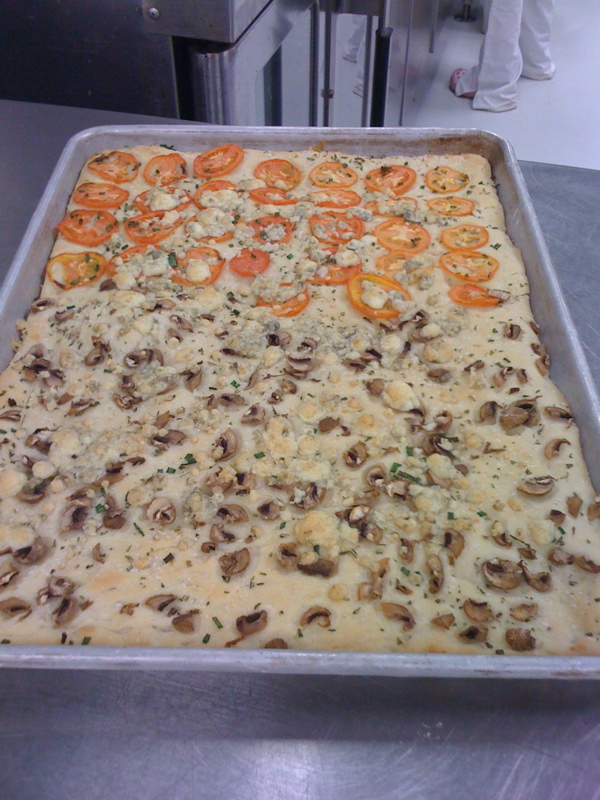 Although it didn't have time for a second rise, our focaccia had a great flavor. The first week or so of culinary school, we’ve spent a lot of time talking. Of course, this is to be expected. We need to learn some basics. Study some things. Find out what uniform is required (and for many, wait on their ordered elements to arrive). But the reason we attend culinary school, the real reason, is to get into the kitchen. I finally got to do so last week in Baking I. My co-bakers and I had about an hour of lecture, and our instructor gave us a list of products we would be making. He also divided our class into five groups of four. Then there was a little delay as we waited for the class ahead of us to finish up in the kitchen, and we were going a little crazy. The promised land awaited us. To pass the time, I wrote out the recipes from our enormous textbook so I wouldn’t have to carry it: croissants, French bread, yeast rolls, focaccia bread and sourdough starter. Quite a bit for one session in the kitchen, but I was ready. We entered, and it was practically a free-for-all. 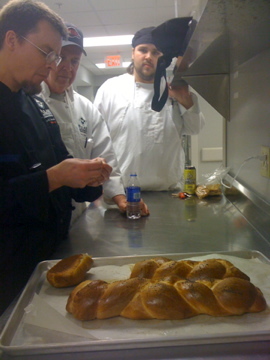 The class was spread out down one long hallway of workstations, as well as in the main kitchen, where our group worked. We scurried for Kitchenaid mixers, scales, bags of yeast and the right kind of flour. Over the next three hours or so, we knocked out one recipe after another, putting one dough in the proofing box (you know, like they have at Subway) as we started the next. The instructor hopped from group to group, demonstrating techniques and inspecting our progress. I appreciated that he was willing to check things and answer questions as we went. 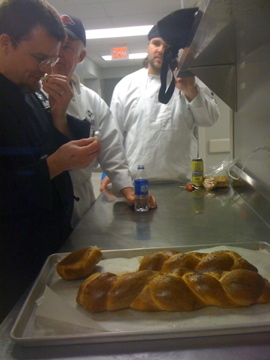 Every so often he would call the class together for a quick demo on smoothing the rolls or shaping the French bread. In our group, at first, I found myself taking over a bit, as I often tend to do in the kitchen. My natural inclination would be to make everything myself. But the others were just as capable, so I gave myself a quick mental slap in the face and let go. We worked together very well, measuring ingredients and setting up equipment for each other. I looked at the temperature reading, and it said 125. Too hot. “Why don’t you reach down there and fix that, dear.” Done. Some of our product was not turning out well. The yeast rolls were a little hard and misshapen, springing up like strange mushrooms on stems in the oven. 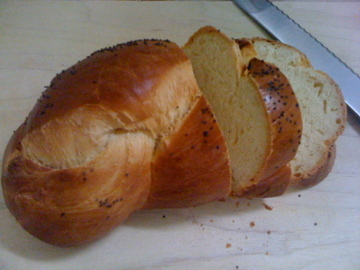 And you could have beaten someone with our French bread, which hadn’t had time to rise properly before time to leave. But the sourdough starter seemed to come together well; we’ll use that next week. One of my teammates rolled out a lovely rectangle of softened butter to use next week in making the croissants – not an easy task. And our focaccia bread, although not getting the benefit of a second rise, was pretty darn tasty. We were allowed to flavor it however we wanted, just the kind of kitchen exercise I really love. I raided the fridge and the walk-in for shallots, garlic, mushrooms, tomatoes and blue cheese (feta would have been better). The instructor seemed to be fairly pleased and forgiving about the whole thing. He knew there were some circumstances (not to mention a plummetous learning curve) leading to less than awesome performance that day, and it was OK. It was the first day in the kitchen. A very fun, crazy, delicious first day. With both anxiety and giddy anticipation, I went to my first college class yesterday in over 12 years. I am now a student of the Pulaski Technical College Arkansas Culinary School. The class was Baking 1, not really a newbie’s course. I took it as an elective, and it just happened to fall first on my schedule this week. Before leaving the house, I was a little nerve-wracked. Do I wear the chef’s coat? Take the baking/pastry kit? Take the massive textbook? Do I need to pin my hair up? I decided to wear street clothes but take the coat along, plus my kit, book, and some hair pins. I was having an unusually fabulous hair day, so I was glad those didn’t get used. Driving to Pulaski Tech’s South campus (nearly to Benton), I missed the exit. I knew it was a tricky one, and I missed it anyway. No problem, I was early. Turned around and got there fine. Walking in the building, I realize I’ve forgotten to bring my class schedule. Did I mention this is the exact nightmare I’ve had for 20 years or so, in one form or another? But in today’s reality, I was able to step into the library, quickly print out a new schedule, and find exactly where to go. Done. I even had time to stop into the Finish Line Café, run by the culinary program. I was glad to see one young man behind the serving line who was obviously passionate about the food he had created. He encouraged me to try his thin crust chicken and bacon pizza. And yes, it was every bit as delicious as promised. Not as healthy as the salad I had in mind, but delicious. The baking class is structured like many of the culinary classes, in a six-hour stretch, once a week. The first portion of time (not yet sure how much) is lecture, and the rest is in the kitchen. We’ll even get out early if we clean up quickly. The first day, disappointingly, we were only in the classroom. But, things had to be gone over — syllabus, rules, dress, safety. Turns out I didn’t have everything I needed to go into the kitchen. Still need non-skid shoes. Chef pants. A hat. These would have been good to know ahead of time, but that’s OK. There was even a bit of confusion about the hats, which are new, and I had to check in the office after class to see exactly what was expected. I really like the instructor. He seems to be the quiet riot type. Mild mannered, very personable and funny. He had been the general manager of Boscos and The Butcher Shop in Little Rock, and now he and his wife own a boutique cake shop, The Blue Cake Company. Side note: In discussion with some student veterans, I found that most instructors at PTC, being part-time instructors and real-world chefs, are fairly easygoing and ego-free. I also gathered which instructors to give a wide berth (just one or two). Mental note taken. The class itself will cover yeast breads, quick breads, pies, pastries, cakes and frostings, cookies, custards, frozen desserts and varnished breads, whatever those are. I guess that’s why we go to school. The instructor had us introduce ourselves, tell a bit about ourselves and state our reasons for taking the course. This exercise revealed the true variety of students within. There were 20 students, and among them, a nearly perfect division of race, age, and background. There were at least five or six retired or displaced workers starting a new career for themselves. 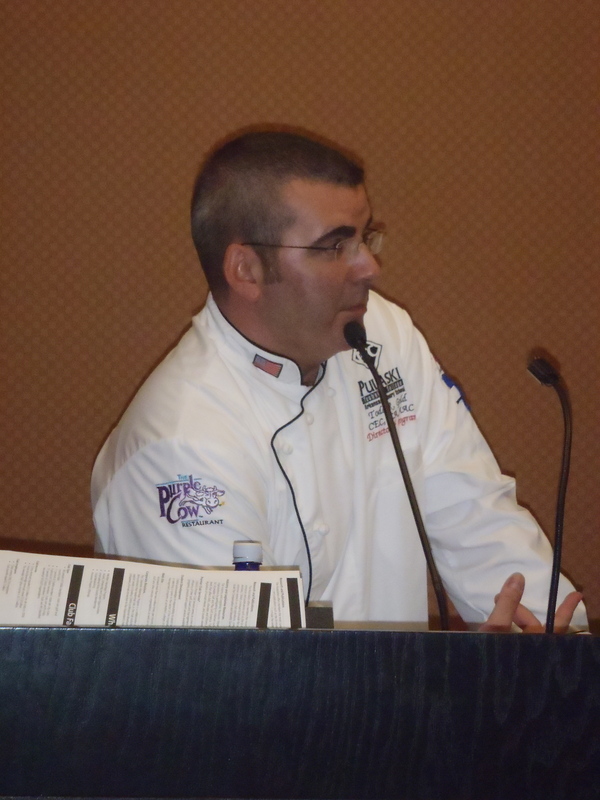 Many had a background working in foodservice, but there were still a good number of us who had not. Ryan, a young guy working in the industry, said his favorite part was the rush, when things get really busy. I’ve heard this from several restaurant kitchen junkies. Another young man said he was a third or fourth generation culinary professional. I mentioned that I write a food blog, and Amanda from across the room pipes up, “Yeah, I follow your Tweets!” What a wonderful world. I know, it wants more frosting. Next time, I'm going crazy with the piping bag. We didn’t have any big plans for New Year’s (I know, we’re old and boring), so I decided to bake a little. Ever since Cupcake Wars on Food Network, I’ve craved some coconut lime cupcakes. OK, so I didn’t actually *see* the show…somehow I missed it…but I saw the flurry of tweets about it. Anyway. Using a stand mixer and the paddle attachment, cream the butter until it’s light and fluffy, a couple minutes on high. Add the sugar and continue until they’re well combined. Turn down to medium speed and add the eggs, vanilla, zest, juice, and cream of coconut; blend until combined. In a separate bowl, sift together the flour, baking powder, soda, and salt. (If the kosher salt doesn’t go through your sifter, just make sure all the other stuff has gone through and dump it into the bowl.) Alternately add the flour mixture and buttermilk into the mixer, beginning and ending with the flour mixture. I’m making the actual coconut optional, since many folks find the stringy shards offensive but like the flavor. But if you like it (and I do), fold it gently into the mixture at this point. Tip: If you don’t normally keep buttermilk on hand and don’t feel like buying it just for 1/2 cup in this recipe, do what I did….make your own! Measure some regular milk (2% or whole is fine) just shy of 1/2 cup, and add a tablespoon or so of lime or lemon juice. Stir it up and let it sit out at room temp for 15-30 minutes. (Hope you read this part ahead of time!) 😉 It will curdle and turn into an instant, fabulously usable buttermilk. Line your cupcake/muffin tin with paper liners, and scoop about 1/4 cup into each one, or until they’re almost to the top, as they don’t puff up a whole lot. Bake at 325 degrees for about 8 minutes. Meanwhile, make the buttercream frosting. I changed this pretty significantly from the original to be more tart and, well, fattening with the addition of more Lopez. Trust me, you’ll forgive me. Wash your mixer bowl and paddle attachment (sigh), unless you’re a foodie goddess or something and have an extra set. Cream the butter until fluffy, and sift in the powdered sugar about a cup at a time. As you get close to the final 1/2 cup or so, check for the consistency you want…depending on your preferences, the humidity, how you’re holding your toes, etc. the amount of sugar will vary. When it looks right, add the vanilla, lime juice and cream of coconut. I like things really tart, so I opted for the higher amount of lime juice. Adjust as you wish. When the cupcakes are done, cool them in the pan for a few minutes, then completely cool on a wire rack. Then (and only then) you can spread on the buttercream. You might notice in my very poor quality photo that I didn’t wait, and the warm cake melted the frosting a bit. I didn’t really care at that point. Sprinkle on some zest, and you’re ready for some really awesome ‘cakes! My next cupcake adventure will probably be salted caramel. I’m seeing a lot of great recipes for these. I’ll keep you posted. Oh yeah, I’m supposed to be losing weight for the new year. Whatever. 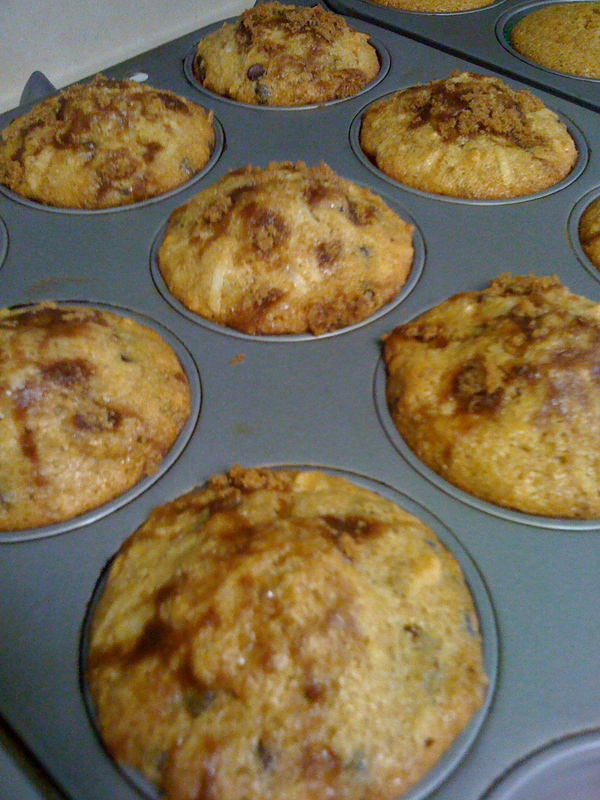 The second, more "experimental" batch of GFCF muffins, with coconut, nuts and brown sugar. Earlier I wrote about making some Gluten-Free, Casein-Free Muffins for my DS’s teacher. They turned out pretty decent! Here’s the whole story, for anyone who cares, along with the “recipe,” if you can call it that. At Kroger, I picked up some flours that I knew were acceptable, but I wasn’t ready to invest in all the supplemental ingredients (Xanthan gum, for example) necessary to make a good consistency. So I trucked on over to the health food store in search of a mix of some sort. I usually don’t believe in mixes, but in this case, I was willing to concede, if only for the sake of completing my mission. And sure enough, I found this, a GFCF Vanilla Cake Mix by Namaste Foods. The first batch, just cake mix with chocolate chips added. One dozen of these in the oven, and I’m getting my typical itch to experiment. Thing is, that itch can be dangerous when it comes to special diets. Luckily, my teacher friend doesn’t have any allergies, so I decided just a few “experimental” muffins wouldn’t hurt. I wrote out every ingredient, just in case. The next batch, I stirred in some coconut and walnut pieces. 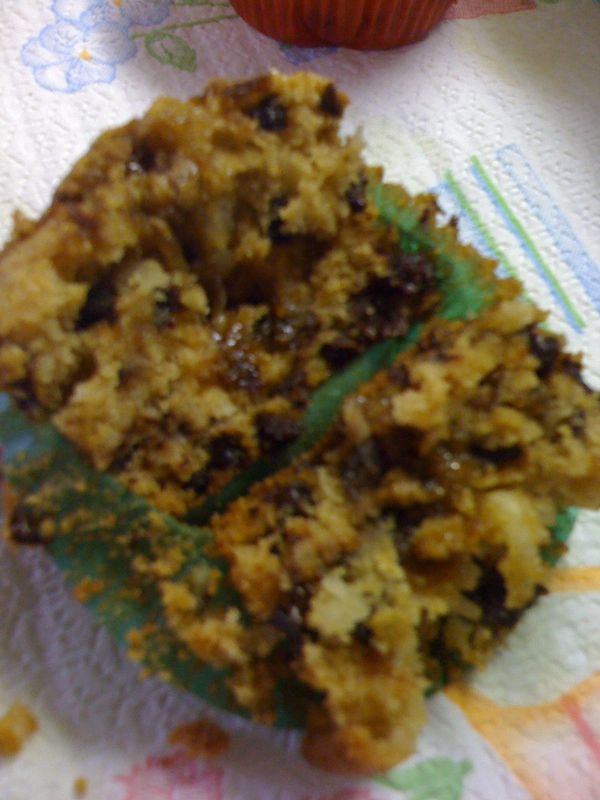 A second-batch muffin, cut open. The goodies are much better suspended in these. These had a wonderful texture, and the coconut seemed to help suspend the chips, which partially sunk to the bottom of the earlier batch. I’m guessing one cup of coconut (to the remaining half-batch of cake mix) and 1/4 cup of chopped walnuts. I sprinkled brown sugar on the tops, but this didn’t turn out like I planned, as the batter rose over the sugar. It did leave kind of a neat brown swirl in the top, though. One problem…since I didn’t plan for experimentation while at the store, I only had “regular” coconut and nuts…with additives. BHT and some other preservative junk. I wrote it all out for my friend, and I told her she could feed those to her hubby if necessary. 😉 Lesson for you: Ask first, then shop accordingly. If it’s for a surprise goody, then get all pure products. She sent me a note later and said she was really happy about her surprise, and that she and the girls enjoyed them. (I am assuming this means the additives were OK, or at least OK enough for someone-else-made-it status.) Give it a try yourself, if you know someone with gluten issues…or even if you don’t! They’re darn tasty, and I’m eating an “extry” as I write this tonight.